I started this little painting around a year ago but in the rush to get everything together for my trip to Speyer I must have put it to one side and forgot all about it. I found it a short while ago along with some blank primed painting boards ….and decided to have a crack at finishing it. 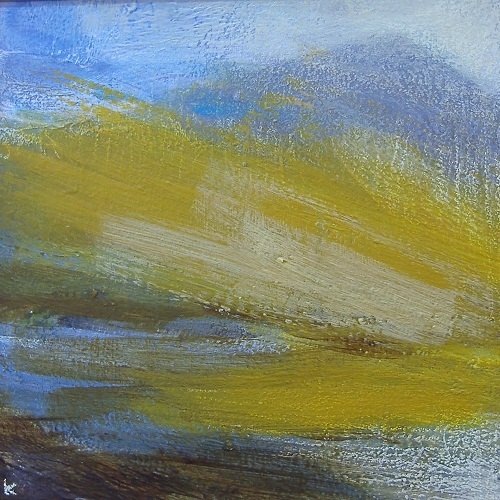 It’s based on the wild spot immediately below Canisp in Assynt. Set below the northern flanks of the hill (as I remember it) are a couple of beautiful wee lochs. If you follow the route described in the books, the path avoids these lochs, climbing above them. However it is much better in my opinion to avoid the path and make across the open and very stony ground to reach these lochs and then clamber more steeply uphill to gain the path higher up. We sat by one of the lochs both on our way up and on our descent. It really is a wild and remote spot …incredibly quiet and stunningly beautiful. On the two occasions we’ve walked this hill, both times in May, we’ve seen no other walkers. The viewpoint from the summit of Canisp is special as your eye is caught by the magnificent outline of Suilven just to the south west. This is definitely a hill to take your time on …in May there’s no shortage of daylight and in good weather you can just wonder across this ancient and awe inspiring landscape.